I’ve been focusing on self-care lately. It can be a challenging task when it feels like the world is roiling around you. I’m trying to drink more water. I’m going to the gym three times a week. I’m heading outside when I see the sun peek out from behind the clouds for a rare hour in this gloomy stretch of Chicago winter. And I’m trying to make simple, vegetable-centric weekday dinners like this kimchi fried rice. This is something special. Dan absolutely loves it, and I make this all the time. If you think you can’t make good fried rice at home I challenge you to give this one a try. With the kimchi, it’s not exactly traditional, but I think it works so well here. f you make extra rice when you cook something else, like, say this black bean bowl, you can have this fried rice the next day. I like to use jasmine rice for this. Ideally you’ll want to use rice that was cooked the day before, but honestly, you can use freshly cooked rice too. Some of us, ahem, sometimes forget to plan ahead and can verify that cooking the rice at the last-minute while chopping the vegetables works too. 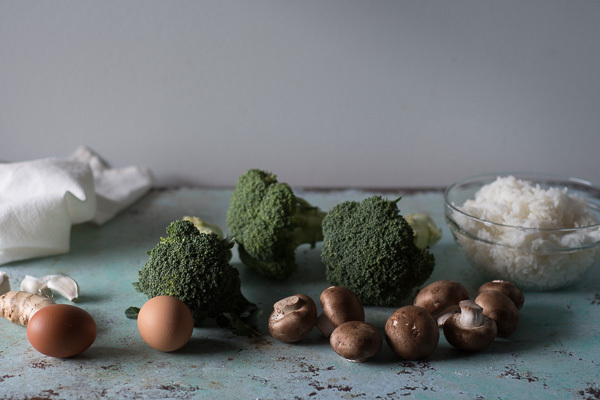 I use broccoli and mushrooms here, but the vegetables are flexible. I always include something green, be it kale or peas or green beans, depending on what’s kicking around my refrigerator. I sometimes add more protein in the form of extra firm tofu (and chicken, pork, or shrimp would be welcome too). But the key here is to always start with aromatic garlic and ginger, and use the trio of soy sauce and sesame oil and sriracha for seasoning. This kimchi fried rice comes together in about a half hour if you’ve cooked the rice ahead of time, more like 45 minutes if you need to cook the rice. It’s a template kind of meal. A kind of meal that after you make a few times you’ll be able to make your own. One that might even make it into your regular rotation. I like to use jasmine rice for this. It works best if you cook the rice a day ahead of time, but if planning ahead isn't your thing, it works with freshly cooked rice too. 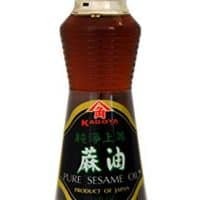 If you want to make this dish gluten free, be sure to use tamari instead of soy sauce. Because kimchi versions vary so widely, anyone with dietary restrictions should be sure to read the label. I'm a fan of Mother in Law's Vegan Kimchi, which is vegan and gluten free. This is vegetarian as is, and vegan if you omit the eggs. Feel free to add protein in the form of tofu, shrimp, chicken, or pork. Just saute the protein in the wok and set aside, then add to back in at the end. Heat a wok over high heat. When the pan is hot add enough oil to coat and then add the garlic, ginger, and broccoli. Saute for about 3-4 minutes, stirring frequently. Add the mushrooms and saute for another 3-4 minutes, or until the mushrooms are deeply browned and the broccoli is tender. 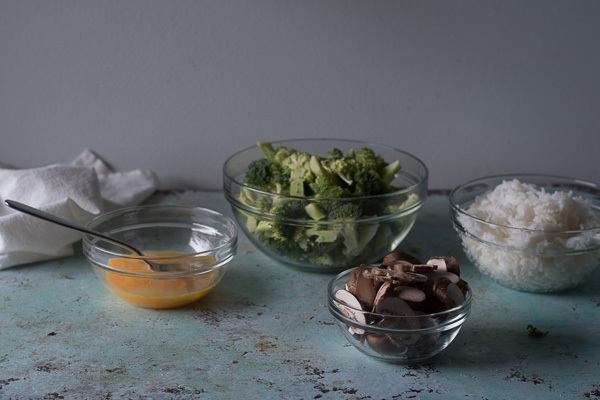 Scramble the eggs in a small bowl. 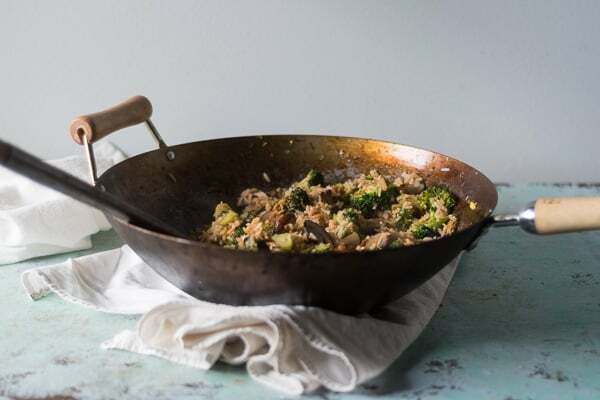 Push the vegetables to one side of the wok (if the pan looks dry, add a little more oil). Add the eggs to the wok and cook to a hard scramble. Break up into bite-sized pieces with your stirring implement and stir in with the vegetables. Add the rice and cook for a couple of minutes (if the rice is cold cook until heated through). Add the soy sauce, sesame oil, and sriracha and cook for a few minutes more. Stir in the kimchi, remove from the heat, and let sit for a few minutes until the kimchi is warmed through. 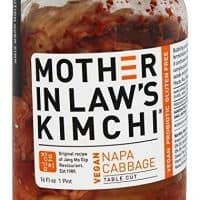 Mother In Law's - Kimchi Vegan Napa Cabbage Table Cut - 16 oz. Thank you! I’ve been so glad to have a couple of days with a little sun! I need to get a wok! I have fry pans, but they don’t work in the same magical way as a wok does. This looks like a delicious way to get your veggies! This is perfect for the rice I have in fridge! And I have all other ingredients too! I had kimchi rice in Koreatown n love it! 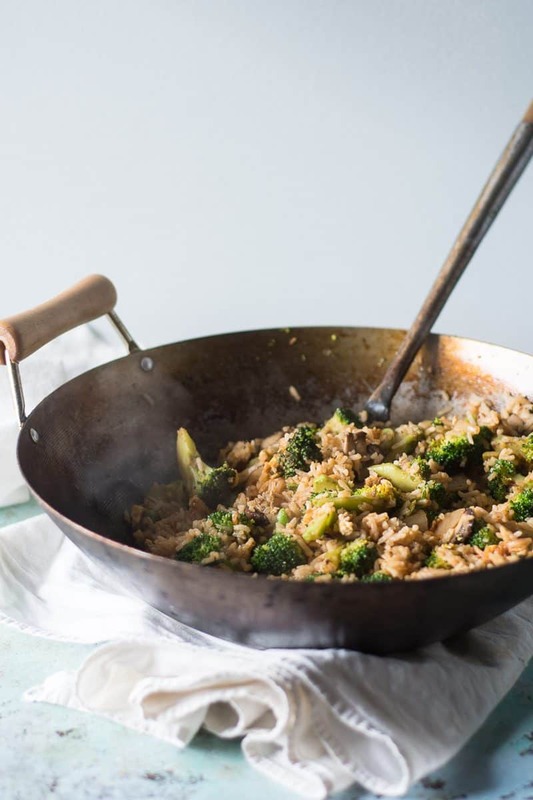 You should totally get a wok! (I mentioned the one I have above.) I use mine all the time! I’ve yet to cook with kimchi, seems like a good place to start! 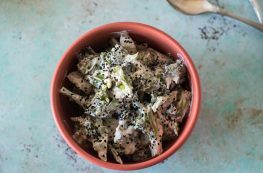 I think it’s a great gateway dish for kimchi!